It was only the first start for Miss Ximena on Saturday at Indiana Grand, but she was carrying far more on her back than just jockey Alex Canchari. 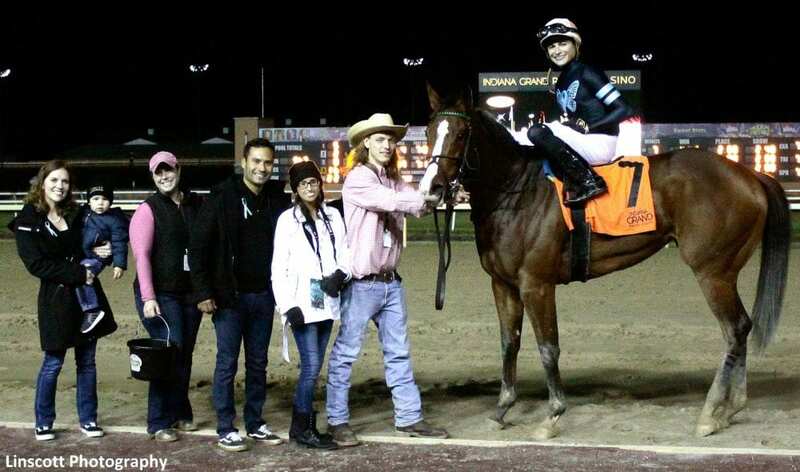 The two-year-old daughter of Flat Out is named in honor of Trainer John Ortiz's sister, Karla Ximena (pronounced He-mena) Ortiz, who is afflicted with the autoimmune disease scleroderma. Scleroderma causes chronic hardening or tightening of the skin and connective tissues. It more commonly affects women and although several treatments to maintain and ease the pain of the disease are available, there is no cure. Each time Miss Ximena races, she will carry special meaning for the entire Ortiz family. The purchase of Miss Ximena was a last minute decision by Ortiz and his father, Carlos, who is a retired jockey. The younger Ortiz had gone to the yearling sales last fall in search of a colt, but nothing had caught his eye. However, Miss Ximena turned his head and as she was walking into the ring, Ortiz phoned his father and got the green light to purchase her. She was knocked down by the gavel at $9,500 to Ortiz Training Stable of Ocala, Fla.
Ortiz has seen a change in his sister since she has become associated with Miss Ximena: she has become a lot stronger and has a renewed outlook. Karla, who has a degree in mass media from the University of Central Florida, has been involved with the filly from day one and was trackside to see her cross the wire as a winner in her racing debut Saturday, Nov. 3 at Indiana Grand. Canchari sat just off the pace with Miss Ximena before making a move in the stretch and scoring the comfortable win by two and one-quarter lengths to earn the lion's share of the $21,000 maiden claiming event over Gift Wrapped and Malcolm Franklin in a time of 1:11.59. The win caps off an impressive season for Ortiz at Indiana Grand. Miss Ximena was his final starter of 2018 and scored his 21st win of the meet to place him 12th on the leading trainer standings. A part-time conditioner at Indiana Grand, Ortiz has a small string in Indiana but is based out of Churchill Downs. He is now in his third season as a trainer and just eclipsed the $1 million mark in earnings for the year, a first in his young career as a trainer. A former assistant for Kellyn Gorder, Ortiz will split his stable this winter, sending half of his 30 head to Oaklawn Park with the other half going to Fair Grounds. He's had a lot of support from new owners along the way but one of his biggest fans is his sister, Karla. In addition to assisting Ortiz when she can, Karla also puts her skills to good use, documenting his wins and work through her videography and photography work. She has compiled several videos and photo albums on social media and her work is outstanding. This entry was posted in NL List, Racing and tagged alex canchari, Flat Out, Indiana, Indiana Grand, John Ortiz, karla ximena ortiz, Kellyn Gorder, miss ximena, scleroderma by Press Release. Bookmark the permalink.